A complex red chili paste called gochujang gives these tasty treats just the right amount of heat. I like spicy food, but I don’t seek out incendiary thrills, which is part of the reason I’m enamored with gochujang, the fermented red chili paste widely used in Korean cooking. Hot enough to mean business, it’s also deep, earthy, roasted, and a touch sweet — and it plays well with other flavors. I combine it with plenty of garlic and ginger, as well as sesame oil, brown sugar, and orange juice, to make a barbecue sauce-like glaze for ribs on the grill. Gas grills are great for recipes like this, which require long cooking times. If using a charcoal grill, be prepared to add briquettes occasionally during cooking, especially near the end, to char the glaze on the ribs. If you’re not up for maintaining the fire, however, follow the variation recipe and start the ribs indoors, then finish them on the grill. Generously sprinkle each rack of ribs on both sides with salt, pepper, and the garlic powder. Either together or separately, wrap the ribs in foil and crimp to seal it. Prepare a medium-hot two-level fire in a charcoal grill (with the bottom vents halfway open) or preheat a gas grill on high for 15 minutes. When cooking, adjust the primary burner to medium-high and the other burner(s) as needed to maintain a temperature of 300 degrees. Place the ribs on the cooler side of the grill, cover and cook, undisturbed, until the ribs are tender and the meat has shrunk away from the bone tips, about 1 3/4 to 2 1/4 hours. Transfer the ribs to a rimmed baking sheet or other large tray and remove the foil. If necessary, add briquettes to the cool side for medium-low heat; if using a gas grill, adjust the secondary burner(s) to medium-low. Meanwhile, in a small bowl, whisk the gochujang, orange juice concentrate, sesame oil, and brown sugar until uniform. In a small nonstick skillet over medium-high heat, heat the vegetable oil until shimmering. Add the garlic and ginger and cook, stirring constantly, about 45 seconds. Add the gochujang mixture and bring to a simmer, stirring constantly. Adjust the heat to medium and continue to simmer, stirring, to meld the flavors, about 2 minutes. Scrape the mixture into a bowl and set aside (the mixture will thicken as it cools). Brush equal quantities of the glaze on both sides of each rack. Clean and generously oil the grill grate, place the rib racks bone side down on the cooler side, and grill, undisturbed, until the glaze on the bone side is lightly charred in spots, about 4 to 8 minutes. Turn the racks over and grill, undisturbed, until the second side is lightly charred in spots, about 4 to 8 minutes longer. 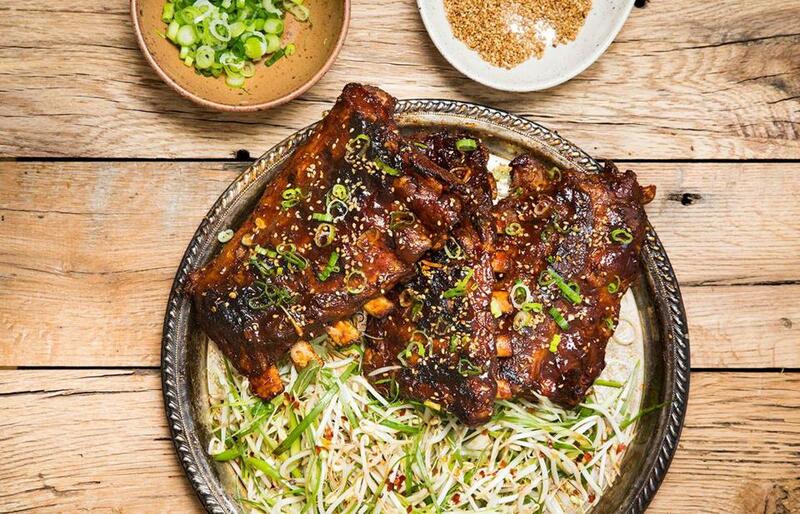 Transfer the ribs to a platter, cut them as desired, sprinkle with the scallions and the sesame seeds, if using, and serve at once. Here the ribs are cooked initially on the stovetop and finished on the grill. This method is adapted from K-Food: Korean Home Cooking and Street Food by Da-Hae and Gareth West. 1) Cut a 5-inch-by-1-inch piece of fresh ginger root into 1/2-inch coins and smash each one. Smash 8 whole peeled medium garlic cloves. 2) Do not sprinkle the ribs with salt, pepper, and garlic powder or wrap them in foil. 3) In a large Dutch oven, cover the ribs with water by about 1 inch. Add the smashed ginger and garlic, and 1/3 cup soy sauce. Set the Dutch oven over high heat and bring the liquid to a strong simmer. Adjust the heat to medium-low, skim off any foam on the surface, if desired, cover, and simmer until the ribs are tender, about 1 1/2 hours. Transfer the ribs to a rimmed baking sheet or other large tray and blot dry with paper towels. 4) Prepare the gochujang glaze as directed. 5) Prepare a medium-hot two-level fire in a charcoal grill (with the bottom vents fully open) or preheat a gas grill on high for 15 minutes. When cooking, adjust the primary burner to medium-high and the other burner(s) to medium-low, and grill with the lid closed. Brush the ribs with the glaze and grill as directed in the final stage of the master recipe. To make the super-thin matchsticks of scallion for the Seasoned Bean Sprouts With Scallions, halve the white and light green parts lengthwise. Cut the halves into 2-inch lengths, turn each piece cut side down, and cut each piece lengthwise into very thin slivers. 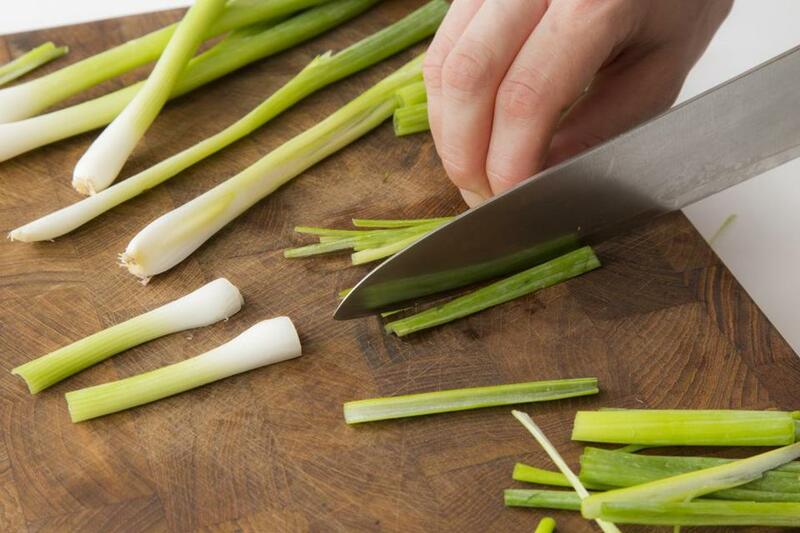 This is easier if your scallions are fairly thick to begin with, and if your knife is sharp! You can substitute about 1/2 teaspoon of crushed red pepper flakes for the gochugaru. Serve the salad immediately after mixing in the sprouts, which start to leach out some of their liquid after about 15 minutes. This is inspired by recipes in K-Food by Da-Hae and Gareth West and in Korean Food Made Simple by Judy Joo. In a large bowl, whisk the vinegar, soy sauce, sesame oil, honey, garlic, gochugaru, and 1/4 teaspoon salt to blend, and set aside. Trim the scallions and halve the white and light green parts lengthwise. Cut the halves into 2-inch lengths and cut each piece lengthwise into very thin matchsticks (you should have about 4 cups, lightly packed). Whisk the dressing to reblend and adjust the seasoning with salt, if necessary. Add the scallions, toss to coat thoroughly, and set aside to soften slightly, about 5 minutes. Add the bean sprouts, a pinch of salt, and about half the sesame seeds and toss to coat thoroughly. Adjust seasoning with salt, if necessary, sprinkle with the remaining sesame seeds, and serve at once.